Is 'stereotype threat' driving women away from science? Could stereotypes be partially to blame for the relative dearth of women in high level jobs in engineering, computer science, and other STEM fields? Recently on NPR's "All Things Considered" Shankar Vedantam discussed evidence of "stereotype threat" in a study that examined recorded conversations between male and female scientists. I had never heard of stereotype threat before and so this study piqued my interest. The concept of stereotype threat boils down to a self-fulfilling prophecy: when people worry a negative stereotype could apply to them, they unintentionally perform poorly (thus fulfilling the stereotype). Mattias Mehl, Toni Schmader, and colleagues wondered whether stereotype threat could be behind why so many PhD level women leave the STEM pipeline (original 2010 study abstract is here). To explore this, the researchers attached a device to the participating scientists that recorded 30 seconds of audio every 12 minutes; then they analyzed conversations between scientists. When female scientists discussed research with male colleagues they were rated less competent than men by research assistants involved in the study, whereas they were rated equally competent as men in social conversations and in all types of conversations with other women. Additionally, when women spent more time discussing research with male colleagues they showed decreased engagement in work (whereas when they spent more time in social conversations with male colleagues they showed increased work engagement). But the opposite was seen for men: talking to other male scientists about research meant more work engagement, while talking about non-research topics with male scientists was associated with less work engagement (there was no link between men's talking to female scientists and their work engagement). Another finding of this paper was that both men and women were less likely to talk about research with female colleagues. As a female scientist, I found the results of this study depressing. Stereotype threat is certainly not a phenomenon that I've consciously been aware of in my day to day science life—I've seen plenty of amazing female scientists who sound equally competent talking to men and women, and who are engaged and excited when talking about their research with men and women (a caveat: because I myself am female, I can never witness a conversation just between men or a conversation between a man and a single woman who is not me; my powers of observation are limited by the fact that just by observing a conversation, I likely change its dynamic). That said, I've read enough studies like this to know that we often aren't consciously aware of the impact of gender stereotypes. For example, surprising recent studies have shown: that the "math is for boys, not for girls" stereotype is internalized as early as second grade, that feminine scientist role models actually discourage girls from trying STEM careers, and that a simple journal writing exercise decreases gender achievement gap in introductory college physics. Why would women feel less engaged about work when talking to men about research? In the discussion, the authors mention that they did not analyze whether the conversations were primarily about the male or female scientist's research (or equally split). That could be an interesting follow up analysis. Were the female scientists consciously aware that they were experiencing stereotype threat? If asked, would they have reported feeling more nervous when talking to male colleagues or is this phenomenon completely unconscious? How would these results be different if female scientists at different career stages were examined? If we want to know why women are leaving science, would it be better to examine the effect of stereotype threat on scientists before the faculty stage? From what I've read, the leaky pipeline mainly affects female scientists before their first tenure track position, when imposter syndrome is common (and I wonder about the relationship between imposter syndrome and stereotype threat in general). On the flip side, does getting tenure help stereotype threat dissipate? 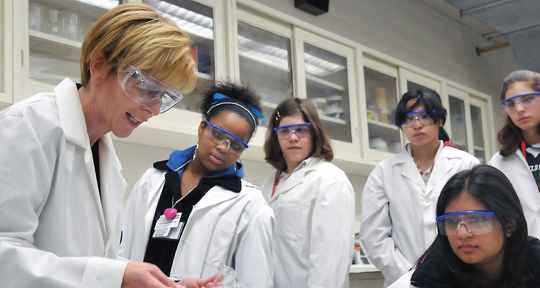 How do we fix gender stereotype threat in science? Vedantam's piece ends with a deceptively simple suggestion: "In order to boost the numbers of women who choose to go into those fields, you have to boost the number of women who are in those fields." And how to do that? We'll save that for another post (or 30).